Kara and I met for out very casual cooking class last night. I was a little bit dreading it because it was so cold and I had to go to class before, but I’m so glad I went. It was really fun, Kara is the best, food is good. 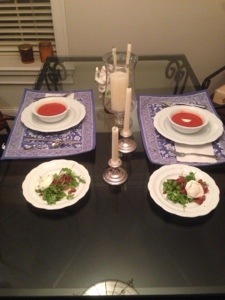 We made spicy tomato soup à la Barbara Lynch and arugula salad. For the tomato soup, Kara didn’t have a strainer so our soup wasn’t as puréed as ms lynch would have advised, but I thought it didn’t detract from the great flavor of the soup. We also made garlic croutons which were so perfectly cooked- they were like the croutons at volle nolle. For the arugula salad, I made our standard lemon-mustard vinaigrette. Kara got really awesome bacon from savenor’s, this adorable market in beacon hill. We topped the salad with a poached egg and some pepper. It’s fun teaching someone who is competent enough to learn. Kara did all of the actual cooking with minimal input from me! Kara said I made a good teacher but I think she’s just a good student. I’ve had to teach people stuff in the lab before and have really lost my cool (like that time I made Helen the bear cry). I’m excited for the season of comfort food but not excited for the weight I will inevitably gain. PS how cute is Kara that she always sets up the table like this?! Also, guess which soup is mine. Hint: not the one with the dollop of crème fraîche. This entry was posted in Uncategorized and tagged arugula, bacon, comfort food, eggs, salad, soup, tomato, weeknight. Bookmark the permalink.